After a grueling ten hour flight from Los Angeles, without sleep, we land at Charles de Gaulle Airport outside Paris. The confusing terminal is so large we have to ride a shuttle train then walk, it seems miles, to reach immigration and finally our baggage. In a daze, we meet our tour leader who moves us on to a van that will take us into Paris and our ship. The ride introduces us once again to the nightmare that is Parisian traffic. We take our place in the massive tangle of cars and creep into the city, inch by inch, the array of red tail lights almost hypnotic. A gray overcast hovers over Paris, light rain and drizzle misting the windshield of our van. How exciting it is to finally reach our ship, the MS Bizet, where we settle in and briefly stretch out on our comfortable beds. Having arrived in time for lunch, we enjoy a grand buffet featuring spare ribs. Before going back to our cabin we walk through the lounge where we have a partial view of the hazy Eiffel Tower in the distance. It’s a joyful sight. Our heads still fuzzy from lack of sleep we retire to our cabin, pull the curtains shut and take a luscious two-hour nap. A certain amount of suffering and tension is necessary to reach our goal, but now we are about to heal. We are up before dawn the next day as we are farther north than at home, and the night lasts longer. Paris wakes up with us. Commuter trains glide by on the elevated tracks close to our ship, their windows brightly lit. The Seine seems calmer this morning, more glassy. The tri-color flag on our stern hangs limply. Seagulls fly by in the chilly morning. A large barge pushed by a tug passes by, disturbing the calm surface of the river. After breakfast we begin our bus tour of Paris, first traveling down a road along the shore of the Seine. Standing on a small island in the river is a statue of Lady Liberty, the statue from which our Statue of Liberty was copied, only on a much grander scale. We pause for a look at the steel majesty of the Eiffel Tower, cameras ready. The sellers of miniature Eiffel Towers are out, ready to descend on our group. Flocks of pigeons fly around the tower, and health-conscious Parisians jog by for their morning runs, ignoring the tourists. Our bus flashes by Les Invalides with its gardens and gold dome. 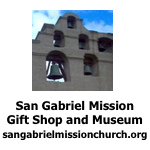 It serves as a hospital for war veterans, its original purpose, and as a war museum. It also holds some of France’s greatest heroes, notably Napoleon Bonaparte. We pass the Rodin Museum, his famous statue, “The Thinker” barely visible over a hedge in the garden outside. We roll by the statues of the Marquis de Lafayette, Winston Churchill and Charles de Gaulle. In our whirlwind tour we zip by high end stores with black and bald manikins or those without heads at all displaying the latest fashions, a statue of Napoleon dressed as a Roman, the Trajan Tower, the Ritz Hotel and the opulent gold columns of the Opera House. A police car passes us with its flashing blue lights and its sing-song siren. Without stopping we breeze by the Louvre with its art treasures, Notre Dame Cathedral, the Sorbonne and the Pantheon. Finally we stop at the Luxembourg Gardens and actually get out of the bus. As we enter the gardens joggers pass in front of us, their shoes pounding on the gravel paths. The walk through the gardens is cold but pleasant, the trees surrounding the pathway a welcome relief from looking at buildings, monuments and statues. The park consists of very little grass, the space between the trees covered with gravel and a thin carpet of fallen leaves. 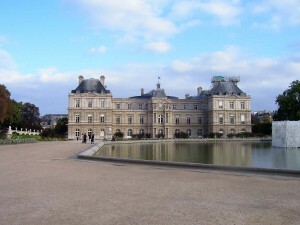 Located within the gardens and surrounded by more formal landscaping is the Luxembourg Palace. This grand building was built for Marie de Medici, Regent of France, in 1615. During the French Revolution it served as a prison and now houses the French senate. Back on the bus and moving onward we pass several outdoor restaurants. The French love to sit, sip and watch people. As we roll by piles of Roman ruins, we note that a McDonalds Restaurant (or as the French call it Chateau McDo”) is directly across the street from it, a jarring anachronism. Our guide tells us that traffic lights and signs are only “suggestions” to Parisians, motorists doing whatever they can get away with. We glance at stone rubble that is all that is left of the Bastille then come upon the new opera house, a modern structure of curved steel and glass that clashes with the standard décor of Paris. Our bus takes us past the metal bookstalls along the Seine, the ornate Hotel de Ville (City Hall), the Tuileries and the Place de la Concord where traffic now circulates, but once was the where the notorious guillotine stood during the revolution. Our bus turns down the Champs-Elysees, the grandest boulevard in all Paris. Straddling it at the far end is the Arc de Triomphe, a massive structure with a large arch beneath, commissioned in 1806 by Napoleon to honor the soldiers who fought in the Napoleonic Wars. A few people are enjoying the view from the top after climbing 284 stairs. After passing the statues of George Washington, Woodrow Wilson and Benjamin Franklin we arrive at the other side of the Eiffel Tower where a grand esplanade on a hill gives us a perfect view. Tour busses are thick here, and hundreds of tourists mill around with their cameras looking for that perfect shot. Among the tourists, tall, slender Africans circulate selling small golden Eiffel Towers that they keep strung on a string or wire. Others push postcards very aggressively, deliberately standing in one’s path so we have to go around them. 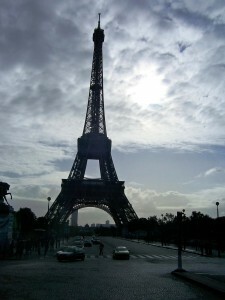 But the view of the Eiffel tower is magnificent. The tour had been cyclonic, a whirl of sights, a revolving collage of places and things with a guide rolling out facts and figures. They all blend together like many colors of paint being stirred in a pot. One of our first stops includes the Luxembourg Gardens with its famous palace now used by the senate. 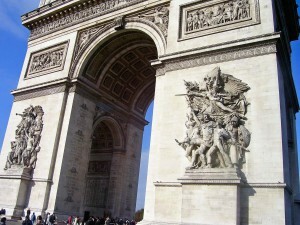 Our bus circles around the Arc de Triomphe for a close look. No trip to Paris is complete without viewing the majesty of the Eiffel Tower.